my eyes propped open by anxiety, the malady that cancels slumber. She went off with my heart and won't set it free. is there for the lovesick if she won't come near? and a haunch like a mound of sand, steep and curving. No slim-hipped, girdled thing is she [whom I describe]. who braves the depths of Dārīn where it lay. From year to year he’s craved it, ever since his moustache sprouted. Yearning agitates the diver in old age. and when he spots it, he flings [care for] his life aside. The pearl is guarded by a jinn—a burly one who sets men amaze. His eyes are open and he is on it. to the diver who risks drowning to obtain it! from his life, and perishes beneath its heaving surface. Who gains it gains eternity without end. His satisfaction is complete, and he is blessed and happy. and you are burnt, and ruin is all you get. Glass is a transparent substance that shares in light. It is better to drink from than any mineral or metal. It is not heavy in the hand, and does not conceal the drinker's face from his companions. Its price is nothing to haggle over. Glass does not absorb grease, and grime does not stick to it. The only thing needed to wash it clean as new is water. Glass is of all things the most similar to water. As marvelous as are its properties, its manufacture is a marvel greater still. My article "Meaning and Captivity in Classical Arabic Philology" is on pages 177-228 of the Journal of Abbasid Studies 5:1/2 (2018). This article is Open Access, and available by clicking on the cover below. 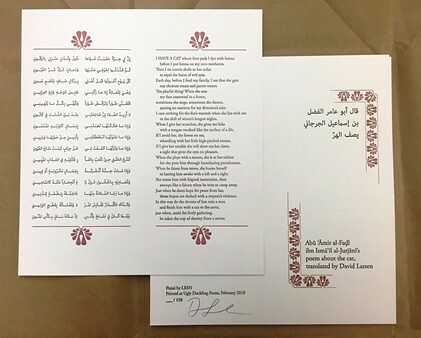 My translation of Ibn Khalawayh's Names of the Lion has received the 2018 Harold Morton Landon Translation Award. To the Academy of American Poets, and judge Ammiel Alcalay, thanks! my spirit, my insides, and all of me altogether. and, at sea in love's distraction, I knew not my place. it came to light through the outpouring of my tears. My endurance gave out. My resilience grew small. Sleep and I parted ways, and my couch was barred to me. are harsh with me. "In love you are a vain pretender,"
It is a wonder and a marvel how I pine for their company. Even in their company, my longing for them flares. will find me among the poor, with nothing on me. will have me [nonetheless] for their intercessor. It was a day of solar oppression by Shumūs. Shams comes up and the shade dissolves." when Dhukā’ 's right hand reaches for the [night's] covering." [enough] to leave a spreading pool for the clay to drink. traces of the milk should last til nightfall. ...like a crafty [wolf] watching al-Jawna [go down]. "[The color] jawn is white and black," he went on to say. "In the dialect of Quḍā‘a it is white, but for neighboring tribes it's black. Also jawn is red." [my horse] lives not by steady equanimity of mind. At the tapering of al-Shams's horn, he said his prayer." Someone other than Tha‘lab points out that the sun is called al-Ghazāla ('The Gazelle') [perhaps explaining why the sun is said to have "horns"]. Others say that the sun's brightness and its spreading rays are called ‘ab’ or ‘ab. "The sun is pounding with its ṣalā’a," is said by another [to mean "The sun shines brightly"]: the ṣalā’a is a chemist's grindstone, used in the preparation of perfumes. We are informed by Tha‘lab, on the authority of Salama ibn ‘Āṣim, that al-Farrā’ said: "A hot day is said to be shāmis and mashmūs ('sunny' and 'besunned'). The sun's uwār is its heat. The verbs zabba, zabbaba and azabba ('to hide beneath hair') are said of the sun's setting, as are ḍarra‘a and aḍra‘a ('to inch along') and karaba ('to succumb to fatigue')." "Who loves night travel in the frigid season?" to set the tribe moving with the gazelles of forenoon?" a teak-grove cast its decorous veil over al-shams. it is lush. The light of the overcast day lands on both sides.